Are you worried about finding the right college for your kids? Does the idea of researching colleges make you nervous? Do you find the idea of finding and paying for college daunting? Do you just want to know how to get started? If you answered “yes” to any to the previous questions, I’ve got a college search cheat sheet for you. I call it my list of 50-50 colleges. And for those who don’t know where or how to start, this is as good of a place as any. The list contains over 400 colleges that have at least a 50% acceptance rate and a 50% graduation rate. I know 400 may sound like a lot but it’s organized by state and it averages to less than 10 colleges per state. 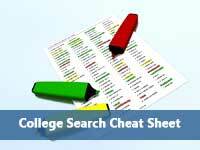 It makes a great college search cheat sheet because it allows you to start learning about colleges you may not have heard of. And the basic requirements to be included on the list ensure that these are colleges most students can get into and more importantly, graduate from. Like any good cheat sheet, it has the basic information to quickly identify colleges that might be possibilities for your family. Type: I list whether the school is public or private. If it’s public, you know that it’s probably a viable financial option if you’re a state resident. If it’s private, you know that will need to use its net price calculator. Full-Time Undergraduates: While I don’t recommend eliminating schools by size early in the search process, I know it’s an important consideration for many families. Just remember, there are a lot more scholarship opportunities at small schools because there are a lot more of them. How Many Years of College Will You Pay For? Graduation Rate: I list the 4-year graduation rate for private schools and the 5-year rate for public schools. As you start looking at colleges not on the list, you can use these numbers as benchmarks. Acceptance Rates: You should pay attention to acceptance rates not so much as an indicator of “quality” but rather cost. Colleges with higher acceptance rates tend to provide more financial aid. The fewer students a college admits, the more it’s likely to charge. This is just basic supply and demand. Test Scores: The list includes the 75th percentile test scores. If students are above the 75th%, they will usually qualify for merit aid at 50-50 colleges. I also show if the test scores are required. Average Net Price: I display the average net price as the most general indicator of affordability. Private colleges with an average net price over $30,000 are probably not generous with financial aid. Those under $30,000 are either good bets for merit aid or need-based aid but not necessarily both. Public colleges that have an average net price over $16,000 are probably not coming anywhere close to meeting students’ financial need. Division: This is the athletic organization and division for the college. Families need to know that NCAA D3 schools, the largest division, doesn’t offer athletic scholarships. This list is meant to be just a place to start. As you look into more details about the colleges, you’ll find things that you like and don’t like. You’ll be able to use those preference to narrow or expand your search as needed. 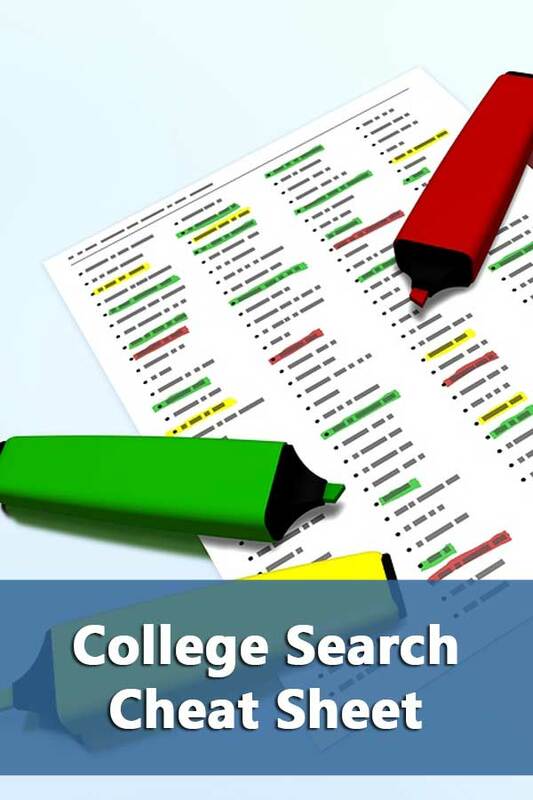 Whichever direction you decide to go, the information from this college search cheat sheet can serve as convenient benchmarks for evaluating other schools.